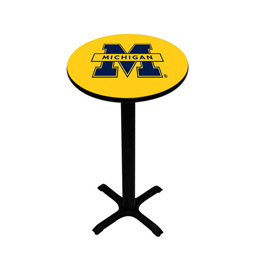 Our laminated pedestal pub table is designed for the budget minded college sports fan. This commercial grade table stands 42" tall with a 24" table top surface and features a school logo approximately 14" wide that is applied with a digitally printed high pressure laminate. The base is black brush with a matte table top.